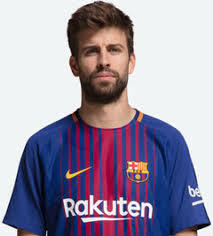 Gerard Piqué i Bernabeu (born 2 February 1987) is a Spanish professional footballer who plays for FC Barcelona and the Spain national team as a central defender. A product of Barça's cantera, La Masia, he initially left the club for Manchester United in 2004, where he remained for four years, before returning to Barça under Pep Guardiola 's leadership, helping the club become the first ever to complete a Sextuple. Piqué is one of four players to have won the UEFA Champions League two years in a row with different teams, the others being Marcel Desailly , Paulo Sousa and Samuel Eto o .
Piqué has also represented Spain, making his debut on 11 February 2009. He played an integral role in the Spain team that won the 2010 FIFA World Cup and UEFA Euro 2012. Since Spring 2010, Piqué has been in a relationship with Colombian singer Shakira. They share the same birthday but she is ten years his senior.